A friend of mine recently remarked, "pictures of historic ruins look like each other [therefore are not that interesting]". It's not the pictures but the architecture, stories and the history associated with them that make them interesting. Asclepius was an Ancient Greek God of Healing and Medicine. You might remember his serpent entwined staff, known as the Rod of Asclepius, still associated with medicine and health care to this day. 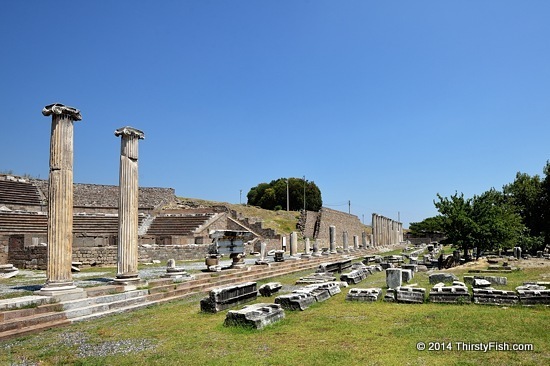 In ancient Greece and Rome, an asclepeion was a "healing temple" dedicated Asclepius. The Asclepeion at Pergamon was one of the first large hospital/sanctuaries in the ancient world. It dates back to the 4th century BC, and Galen, the most famous doctor in the ancient Roman Empire worked there for many years. The complex housed a Roman theater, meeting places, the Temple of Asclepius, healing spring, library, baths, circular treatment center, sleep and surgery rooms. Treatments included psychotherapy, massage, herbal remedies, opium, mud and bathing treatments, dream interpretations and drinking of healthy/healing water.